The Cinema Museum and Andy Holden are delighted to present the London premiere of Laws of Motion in a Cartoon Landscape (2011-2017), the artist’s acclaimed film proposing that the world is now best understood as a cartoon. More than five years in the making, and containing nearly 400 clips from the golden age of animation, the two-channel Laws of Motion in a Cartoon Landscape, and a series of recent related short cartoons are shown within the evocative, historic setting of The Cinema Museum, the capital’s only museum dedicated to cinema history and culture. 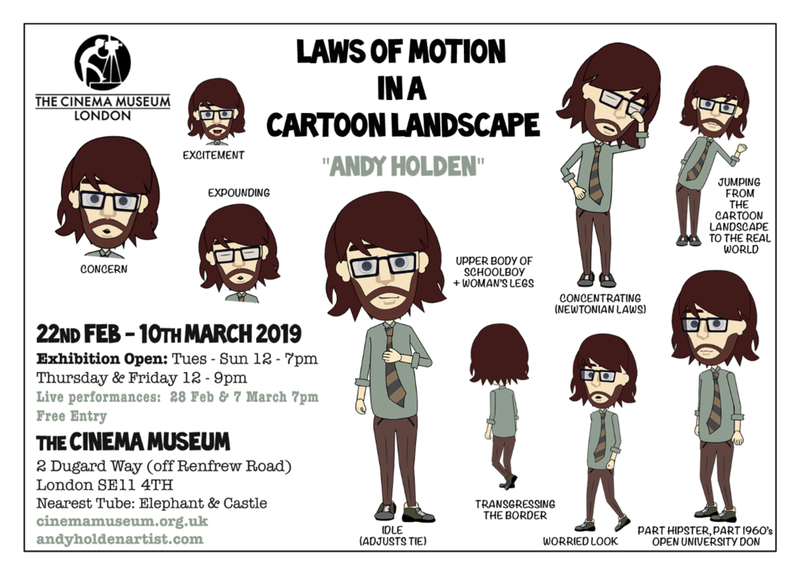 Laws of Motion in a Cartoon Landscape sees the limitless possibilities of today’s world through the prism of ten ‘motion laws’ delivered in a tone that is part-lecture, part-documentary and part-conspiracy theory by the artist in the form of a cartoon avatar. Laws such as Everything falls faster than an anvil and Any body suspended in space will remain in space until made aware of its situation are combined with Greek myths, philosophy, politics and physics, and hundreds of clips from cartoon directors such as Tex Avery, Chuck Jones and early Walt Disney in an exploration of the world as an irrational space where anything can happen, yet certain things reoccur, and in which a new set of laws have formed. Screening in the Museum’s small cinema, are Holden’s recent series of animated short films, each the length of a cartoon, which further investigate aspects of the Cartoon Landscape. I Wouldn’t Dream of It (2017) sets Freud’s Interpretation of Dreams within Scooby Doo houses; Prelude is a walk through the landscapes of Wile E. Coyote & Road Runner, combined with fragments of Wordworth’s Prelude narrated by the artist’s ‘last man’ animated avatar; and What a Time to Be Alive is “set in 2016”, a point taken as the start of the “Cartoon Landscape”, in which the animated cartoon artist finds herself wandering inside memes and unlikely moments from recent viral internet history.